Alabama Hostage Standoff Continues : The Two-Way A 5-year-old boy has been held captive in an underground bunker since Tuesday. Authorities continue to negotiate with his captor. The child's bus driver was killed before the kidnapping. His sister says Charles Poland, "would have done anything to protect those kids." 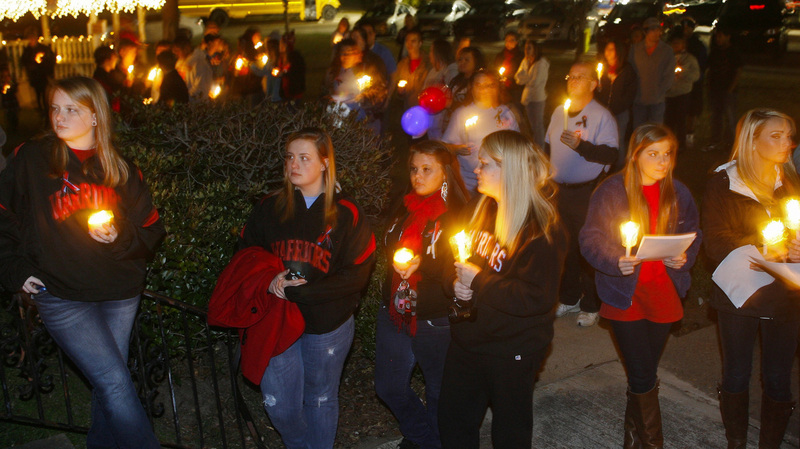 Thursday night in Midland City, Ala., there was a candlelight vigil for bus driver Charles Poland, who was killed Tuesday before a gunman snatched a 5-year-old boy — who is being held captive in an underground bunker. The standoff continues this morning in Midland City, Ala., where a 5-year-old boy has been held captive in an underground bunker since Tuesday, when a gunman abducted him from a school bus after killing the driver. Authorities are talking to the suspect, 65-year-old Jimmy Lee Dykes, through a pipe that leads to the bunker. Local Sheriff Wally Olson, according to AL.com, says "there is no reason to believe the child has been harmed." Idaho's KHQ-TV spoke with a sister of the fatally wounded bus driver, who authorities say had tried to stop the gunman from taking any of the children. Vicki Upchurch says her brother, Charles Poland, "would have done anything to protect those kids."